Directions: From Truckee, at junction of Highway 89 North and I-80, take Hwy 89 North for 1.5 miles to Prosser Res. turn-off (USFS Road 18N74). Turn east and go 1 mile to campground. Prosser Creek can be reached from Hwy 89. Take Alder Creek Road about 2.5 miles west and turn onto a dirt road to your right that brings you to a bridge just above the forks of the Prosser. The road continues into the Carpenter Valley running along the creek. 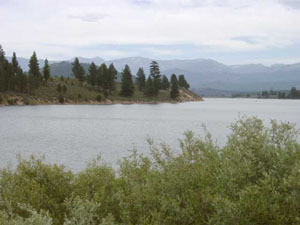 Prosser Creek Reservoir contains a large Brown trout population and is planted with Rainbows. The lake is open year round with ice fishing popular during the winter. It can be fished from a float tube working along the banks and near the Dam. This reservoir is particularly good during ice-out in mid-March to mid-April. The trout that were trapped under the ice flow feed ravenously. Small Buggers with nymph droppers are very effective using a sinking line and a slow retrieve. Good fishing areas are the points on both sides of the dam. If the lake is full, good hatches come off at the mouth of Alder Creek during July. The Fall months can also be good when low water conditions exist causing the fish to become concentrated. Prosser Creek: Prosser Creek consists of a North and South Fork as well as a main stem that enters the reservoir. The creek is heavily planted with Rainbows at the Highway 89 crossing. Your best flyfishing opportunities are further upstream. The main stem consists of mostly rainbows and browns in the 9-12 inch class. It is mostly small pools with runs. The North Fork begins about 4 miles from Hwy 89. It consists of mostly Rainbows with some pocket water. The area consists of mostly private land but a trail runs along the creek from the bridge above the forks. The South Fork has Rainbows, in addition to Brookies (7-9 inches) and Browns (9-12 inches). It flows through a canyon above the forks with small pools, runs, and pocket water. Further upstream, the South Fork is a small flow through private meadowland. Alder Creek: Alder Creek is a small meadow stream with some dense brush along it's banks west of Hwy 89. A trail as well as the Alder Creek Road run alongside it. The creek consists of rainbows (6-10 inches) and some browns(6-8 inches). On the east side of Hwy 89, the creek runs through an open meadow.